We have seen lot many companies are investing in open Source Android operating system. We hear almost everyday device launch by some brand which are powered by Google's Android. But many of are waiting for most waited Windows flagship phones by Microsoft Lumia 950 and Lumia 950 XL. The wait is finally over as Microsoft has launched their Lumia 950 and Lumia 950 XL in India on November 30, 2015. As you can see above this flagship devices are launched under tag line "The Phone That Work Like Your PC". This almost good to be true. But one thing I must say the features of this flagship devices are excellent but they seems to be overpriced. 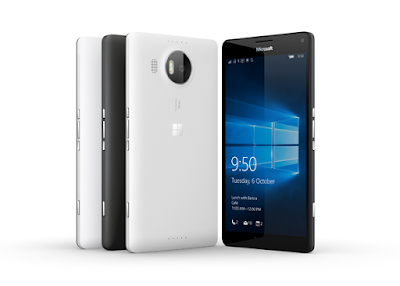 Microsoft Lumia 950 is design very sleek and simple as standardized design on Microsoft. This device is powered by Microsoft latest version of operating system Windows 10. Device have newly launched Microsoft assistance Cortana integrated. It also include Iris scanner inbuid which they called Windows Hello. This feature is still in beta mode. Lumia 950 have 5.2 inches stunning 2K AMOLED capacitive touchscreen display with resolution 1440 x 2560 pixels having 564 ppi pixel density. Screen also provide user with Corning Gorilla Glass 3 with dual SIM option. On processing end this device provide Hexa-Core bit CPU with Qualcomm Snapdragon 808 processor empowered by 3 GB if RAM memory. Lumia provide 32 GB internal memory and external can be expanded upto 200 GB which according to me is lot more. With business if you are camera geek then Microsoft Lumia 950 will not disappoint you on that end too. Lumia 950 equipped with 20 MP camera having Zeiss optics lenses, 1/2.4' sensor size, 1.12 µm pixel size, PureView technology along with Triple LED RGB flash. This will allow you to take hi quality pictures with faster image stabilization and best quality also record videos at 4K resolution. For front camera device provide 5 MP capable of recording Full HD videos. On connectivtiy part device have Dual SIM stanby and both SIM supporting 4G LET network. It alsp have Wi-Fi: MIMO, WLAN IEEE 802.11 a/b/g/n/ac and Bluetooth 4.1. 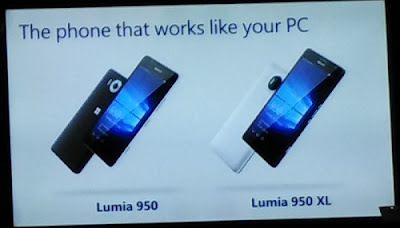 Lumia 950 comes with two color variants : Black and White. It have 3000 mAh battery power with USB type C fast charging support. Lumia 950 XLruns Windows 10 and packs Continuum capabilities with Dual SIM standby. 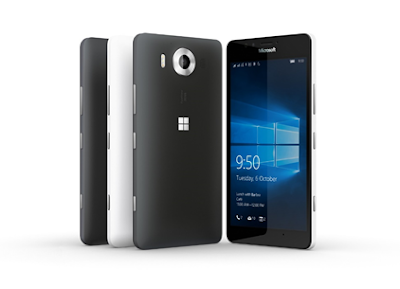 Lumia 950XL have 5.7-inches Quad HD AMOLED Screen having Corning Gorilla Glass 4 display protection. It have resolution 2560x1440 with 518 ppi pixel density. It also have feature like Windows Hello, Cortana, continumm. This device have Qualcomm® Snapdragon™ 810 processor featuring Octa-core CPUs and 64-bit capabilities. As we talk about inbuild memory it is same as Lumia 950 : 2 GB RAM with 32 GB ROM memory with expandable memory option upto 200 GB. On Camera front this device have Rear-facing PureView camera with a20-megapixel sensor, Zeiss optics, OIS, triple LED natural flash, and 4K video recording. In front camera it have 5MP wide-angle with 1080p video recording. 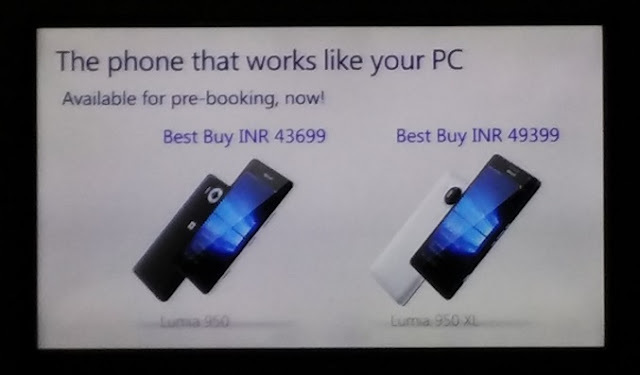 This smartphone have same connectivity option as Lumia 950. Lumi 950XL is available in White and black Color. For power option this device have 3340 mAh battery. This device comes with USB type C fast charging option. Use your Lumia 950 and umia 950 XL like a PC by connecting it to a bigger screen, keyboard and mouse with Microsoft Display Dock, an optional accessory that enhances the new Windows 10 Continuum experience — and concurrently charges your device. When you’re connected, Windows apps can scale smoothly and display beautifully on the bigger screen, helping you to get things done. Work on a Microsoft Office document, browse the Internet or stream movies for your kids. Plus, you can use your phone independently to take a call or send a text message while you continue to work on the bigger screen. Get the Microsoft Office and Outlook experiences on your mobile device, or use Office 365 with Microsoft Display Dock to unleash the power of editing features on a bigger screen for a PC-like experience too. So you can use your device in 2 way. Both devices are running different Windows 10 instances for bigger screen as well as for Lumia devices itself. So for using device at the same time using it on other screen simultaneously. So I can edit my files in PC and pick up the call at the same time using Microsoft Display DOC with these flagship devices. So this is all about it. If you have any suggestion and opinion let us know in comment below. Thank you for reading.